Quick question: Are you sad to see the end of October, 2008? I suspect that most of us are happy to see the end of the worst month on the markets that any of us have lived through (unless you are really, really old). 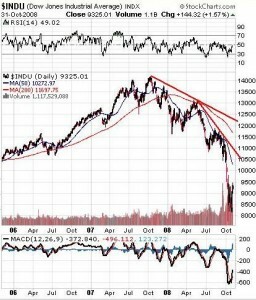 The Dow ended September at 10,850 and by October 27 it had fallen to 8,175, a drop of 25% in less than a month. A year ago, on October 9, 2007, the Dow was at 14,164, so in just over a year the Dow fell by 42%. That’s not a great year by anyone’s standards. On October 30, 2007 gold was trading at 782.10; gold closed on October 30, 2008 at $736.70, a drop of 6% in a year. I’m not happy that gold has fallen, but compared to what’s happened with stocks, gold has held up remarkably well. (And yes, if you want to compare apples to apples, it is true that gold was over $1,025 in March of this year, and fell to the $700 level earlier this month, for a peak to bottom drop of 32%, but that’s still much better than the performance of stocks). After the crash in October, 1929, the Dow bottomed at 198 on November 13, 1929 and then rallied 48% to close at 294.07 on April 17, 1930. Is that where we are now? Unfortunately, from that peak at 294.07 on April 17, 1930, the Dow then fell to 45 on July 11, 1932, for a drop of 85%. (By the way, go to Yahoo and use their interactive charting feature to create these charts for yourself, for free). Where are we now? I have no idea, but it is entirely possible that the “dead cat bounce” we have experienced this week, with the Dow going from 8,175 at the close on October 27 to the 9,325 close on October 31, a gain of 14%, is simply that: a dead cat bounce. We all know that the markets are heavily manipulated, so it is entirely possible that the bounce in the stock market and the crash in oil prices just before the U.S. election is simply more market manipulation, and is not the beginning of a new bull market. Does this chart look like a bull market? I still see strong down trend lines, and until we close decisively above 11,000 the trend will still be down. Yes, we may have made a bottom, but that does not mean the market is going up. As we say in the early 1930s, a market can trade sideways and slowly downwards for many years. Oct. 30 (Bloomberg) — In the third quarter of 2007, Volvo AB booked 41,970 European orders for new trucks. Guess how many prospective purchases Volvo, the world’s second-biggest maker of heavy rigs, received in the third quarter of this year? Here’s a clue. Picture a highway gridlocked by 41,815 abandoned trucks — because Volvo’s order book got destroyed to the tune of 99.63 percent, with customers signing up for just 155 vehicles in the three-month period, the Gothenburg, Sweden-based company said last week. The pathogen that has fatally infected swathes of the banking industry is now contaminating non-financial companies. “We’re heading toward the sharpest downturn I’ve ever seen in Europe,” said Chief Executive Officer Leif Johansson. When you go from producing 42,000 trucks in a quarter to producing 155, the economy is in big trouble. That does not sound like the start of a new bull market to me. It would appear that Barack Obama will be the next president of the United States, and if the voting irregularities can be kept to a minimum that may even be confirmed this week (although my gut tells me this could drag on for a while). The purpose of this blog is not to talk about politics, and so after Tuesday I’m going to put a stop to all of the political commentary over on the Forum. I don’t read it, and I suspect many of you don’t either. I am a Canadian, so I don’t have a vote this Tuesday, so my opinions don’t matter. But for those who care, all I can say is Good luck, America. There is more to discuss, but my thoughts have not changed since last week. I still believe the manipulation in the gold and silver market will end with a force majeure declaration, and I still believe the markets are headed lower. I’ve been wrong before (in fact, I’ve been wrong all year), so take my comments for what they are worth (which I guess is what you pay for them). Let me know on the Forum whether or not the bottom is in, don’t forget to “fall back”, and good luck, America.